Saturday lunchtime:busiest I'd seen it.My carrying a paint tin (No 32), occasioned much merriment.Not all beers noted. Rother Valley - Smild 3.80 Pretty close to exceptional.Luscious dark mild:chocolate,molasses,earth. Ramsgate Brewery (Gadds') - DogBolter Dark Porter 5.60 Not Tried Tempted,selling well. A rare midweek,midday visit.Quite busy,given the inclement weather.Several dark 'uns being enjoyed. Goacher's - 1066 Old Ale 6.70 Pleased to find this;fruity and austere. An infrequent weekday visit on a damp November Thursday.A few in.Not all beers listed. Cellar Head - India Pale Ale 5.00 Juicy, arboreal:fulfilling. The local schoolchildren were on half-term holidays which meant that it was safe to wait for the 3.30pm bus, so I came in here and enjoyed a couple of pints whilst waiting for it. Fairly quiet in here this afternoon. Bank Holiday Monday afternoon and bustling with drinkers and a few diners. A good welcome from the guv as usual. I sat at the far end of the bar and noticed that out of all the customers at the bar (and there were a lot of them) all but one of them were drinking pints of the dark uns, I think Dosser would have been impressed. I had visited two other pubs in the town centre earlier and it was interesting to note how busy this place was compared to its competitors. Wantsum - Black Prince 3.90 A dark mild in very good condition. Pig & Porter - Dance First 4.20 A really enjoyable stout. Titanic - Plum Porter 4.90 Not Tried Selling very well in here today. JW Lees (see also Lees) - Boatmen 3.90 Not Tried Just a taster, not for me unfortunately. Quiet early Sunday lunchtime.Good chat with the Guv. Great to see this pub reopen after 50 years-I remember it as a pub, but I was too young to partake! Angels & Demons (also uses McCanns branding) - A.D.H. ME 5.20 Tried this in 3 formats,today-cask-was the best.Solid,dependable beer. Pennine (Batley) - see now entry for Pennine (Bedale) after move - Real Blonde 4.00 Not Tried Several other beers available. Second day of reopening as a pub, I arrived soon after 12:00 opening on a Saturday and the pub was already busy. Four beers had already sold out by close of business on opening night. A good welcome from the guv (Ray) who has come out of retirement to run this venture and has previously run some highly respected real ale pubs. Ilkley - Ruby Jane 4.00 The last one before it ran out. Very acceptable. The pub is found in Tenterden, Kent, TN30 6AD. Small pub situated in East Cross, Tenterden. 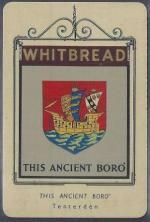 In the 19th Century it was known as the New Inn but later changed its name to This Ancient Boro', it was sold by Whitbread Fremlins in the late 1960s or early 1970s and became the Honeymoon Chinese Restaurant and traded as such for around 50 years. It reopened as a pub on 13 July 2018 and has a selection of cask ales on gravity dispense from behind the bar using cooling jackets. At the time of opening it is wet sales only but the tapas menu should be available in late July or early August 2018. We have visited this pub 7 times, seen 44 different beers and tried 12 of them.